Israeli by Day, American by Night: What's Up With Israeli Pizza? Just a friendly reminder, use of the term "gospel" is not a name per se, but implies there's something divine in them. There is great debate as to whether the apikourus Yesh"u actually even existed, or was a compilation figure. The Talmud refers to oneof figures of this name who lived at different times. Regarding pizza, if you found good pizza in Israel, then it's once in a lifetime. I never thought there was such a thing. For pizza, go to Sicily. For Shwarmah and Fallafel stay right where you are. BTW, did you have green fallafel in Tiveria? You see Danny, I wasn't going to have lunch today, maybe eat something light, low fat, no taste? And now I'll have to order some pizza! Thank you very much, maybe I'll send you the bill? 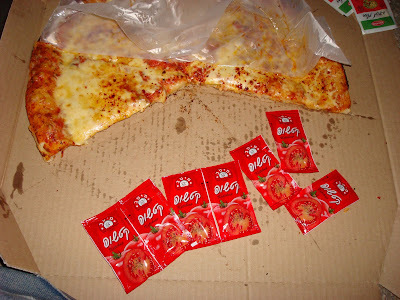 Anyway,I like ketchup in my pizza, and mustard too! what about the green pizza spice. Hey, great idea for a blog. I was happy to find it. Take care! Danny, one of the greatest inventions I loved in Israel, back in the days (mid to late 70s) was the coffee that you made by putting a little Cafe Elite NesCafe with a tiny amount of water into a cup, stir it for like half an hour, and then pour hot water in. Best coffee I ever had. These days with all the fancy coffee choices available, I don't know if people do that any more. I still drink that coffee. As well, the pre-Shabbat cake we used to get on the Kibbutz, it was simple stuff, but man, it tasted good. Then again, after the Army food we had, anything would taste divine. It's the Bulgarians themselves that eat their cheese with watermelon... I guess some Bulgarian Jews must have introduced this combination along with the cheese itself. Not to be contentious with Ben-Yehudah, but I believe that in the Queen's English as well as in the All American, gospel is a name. We don't have to agree with the teaching of other religions but what we must not do is try to change the language that we all understand. Drive on Danny, your writing is great! 2. the story of Christ's life and teachings, esp. as contained in the first four books of the New Testament, namely Matthew, Mark, Luke, and John. 4. something regarded as true and implicitly believed: to take his report for gospel. 5. a doctrine regarded as of prime importance: political gospel. 6. glad tidings, esp. concerning salvation and the kingdom of God as announced to the world by Christ. 7. (often initial capital letter) Ecclesiastical. an extract from one of the four Gospels, forming part of the Eucharistic service in certain churches. 9. of, pertaining to, or proclaiming the gospel or its teachings: a gospel preacher. 10. in accordance with the gospel; evangelical. 11. of or pertaining to gospel music: a gospel singer.